George Sorus is the billionaire who earned the title of the man ‘who broke the Bank of England’. This was when in 1992 his bets against the pound forced the UK to withdraw from the European Exchange Mechanism. Since then he has donated more than $32 billion to the Open Society Foundation (OSF), which he founded in 1979. He transformed the organisation into the world’s second largest philanthropic fund. from Poland’s Government who accused him of wiping out “any semblance of checks and balances”. In Romania the leader of the ruling Social Democrat Party said Mr Sorus and ‘the foundations and structures that he has funded since 1990 have financed evil’ in the country. Since the Hungarian born (but now a US citizen) Sorus made himself a persona non grata to governments across Eastern Europe and been accused of having a hand in the fall of several governments, he has now shifted his activities to Britain and Brexit . This is being done under the banner of ‘Best for Britain’, which under his chairmanship has started a well-financed campaign to reverse the 52-48 support for Britain to leave the EU and return in full support. To back it he has the support of the free-sheet London Evening Standard, edited by the former Tory Chancellor, George Osborne, still suffering from sour grapes. The owner of this anti-Brexit propaganda sheet is the former Russian Evgery Lebedev (now a UK citizen) whose father was in the KGB. Criticism of Sorus within the ranks of ‘Best for Britain’ by some of his supporters is not allowed. Others have denounced these critics as being anti-Jewish (because of Sorus’s origins). Board members of Best for Britain include Gina Miller, the British Guiana-born liberal-left lawyer, and Sir Martin Sorrell, the chief executive of the world’s largest advertising agency, WPP. Let us look at some of the other board members, and chums of Sorus. Stephen Peel, who worked his way up to executive director at Goldman Sachs, had previously donated £25,000 to Best for Britain when he attended the dinner at George Sorus’s home when OSF was set up in October 2016. Another board member is the cross-bench peer in the House of Lords, Lord Mark Malloch-Brown, the former UN deputy secretary general. At the above dinner meeting he unveiled a marketing blitz which would be put in place and that would heavily target young people and assert to the British public that Brexit was not a done deal, They already had a ‘range of guerrilla marketing tactics in preparation’ to seize attention. Turning to the House of Commons itself, an MPs’ committee chaired by Tory MP Anna Soubry has been formed as the All-Party Parliamentary Group (APPG) to support campaigns to overturn Brexit. It is no surprise to see that it has been given £21,000 by Best of Britain. APPG is co-chaired by Labour’s Chuka Umunna. Tagged Brexit, britishdemocrats.uk, Brotish Democrats, Sorus interfering in UK Politics. It is no surprise that a man like this has the eyes and ears of the powers that be, a healthy society would have long ago showed him the Red card. The main Point of the article is that it is clearly WRONG for Insidious organisations or People to undermine Democratically Elected Governments. However , the constant reference to our Referendum Vote being close , shows how Powerful these People are. They ‘ fixed ‘ the Referendum by giving Votes to MILLIONS OF GUEST WORKERS AND ‘ DUAL NATIONALITY CITIZENS AND IT SILL WENT WRONG FOR THEM , BECAUSE THE INDIGENOUS BRITISH VOTED 85% TO LEAVE. These People have HOODWINKED everyone into believing the Vote was close. In reality it was not ! I have had a couple of People , whilst agreeing with my sentiments , have cast Doubt on my figure of an 85% landslide vote FOR BREXIT. Since then I have seen an Article on M.S.N. that , whilst spreading the usual Gloom , has said that the PEOPLE OF TEESIDE / MIDDLESBRO Area , VOTED 85% TO LEAVE. As one of the People canvassed said ” I am sick of the Adverts on the Television that show all these Mixed Race Families. That is London , we are NOT LIKE THAT HERE. My Point exactly , that Area that Voted so heavily to LEAVE , has NO first , second or Third Generation Pakistani DUAL CITIZEN PEOPLE. NEITHER DOES IT HAVE POLISH WORKERS. Just INDIGENOUS BRITISH PEOPLE , VOTING 85 % FOR BREXIT , JUST LIKE I CLAIMED ! John Bean has highlighted the sinister alliance of anti Brexit former chancellor George Osborne and his new boss at the Evening Standard, Evgeny Lebedev, the latter uses his fathers billions to fund an expanding mass media empire, and further his political influence. This currently revolves around trying to undermine and even reverse our democratic decision to escape from the corrupt EU, promoting the cultural malaise which is commonly known as diversity, and challenging logical perceptions on gay, feminist and transgender issues. When you add Mr Soros to the equation, These three meddlers are most definitely singing from the same hymn sheet. The involvement and acceptance of multi-billionaire George Soros in the Remain Brexit debate reveals the attitude of the ‘REMOANERS’ towards the Great British Public. 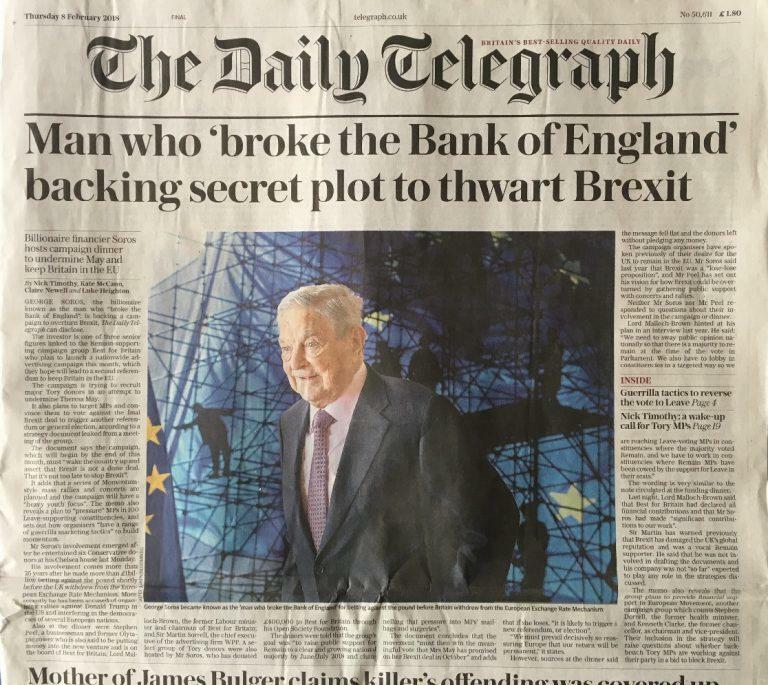 Soros seeks to use his financial power to steamroller the democratic process in the UK and reignite Project Fear and the remain side accept this as normal. Soros is a multi-billionaire non-British resident and the only reason for his involvement in British Politics is to further his worldwide business interests. If he were a multi-billionaire Russian would his interference be tolerated? Well we know the answer to that.